I honestly think the last time I had Cornish hens was at my cousin’s bar mitzvah in 1969. Back then, they were all the rage at special occasions and were considered a “step up” from a lowly piece of chicken. But come on. Are these not the purdiest things ever? A perfect individual mini chicken portion to serve you or your guests. Can’t get any better than this. Now wait a sec. How is it that I have never made these birdies? No clue why, especially since I’m classified as a chicken freak. And what exactly is a “chicken freak”? A person who eats chicken almost every damn day. That’s who. But really, who doesn’t enjoy a comforting and fancy shmancy looking dish like this? I served this meal for our anniversary dinner this week and even though the table was set for two, it was a show stopper. 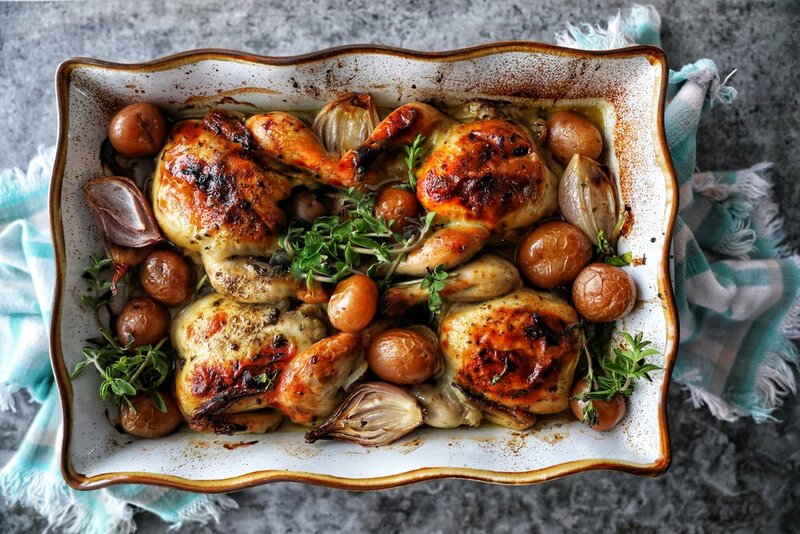 In this recipe, a flavour packed marinade including Moroccan inspired spices transforms these cute little hens into the next level of deliciousness. But, the star of this dish really is the Ras El Hanout. I used this blend in another recipe that I created for President’s Choice this year, and boy was it ever amazing. I know you want some info on this spice, so here ya go. Essentially, it's heaven in a jar. That’s what it is. This one in particular is a blend of 24 spices – including cinnamon, cumin, chilies, coriander, nigella seeds, cardamom and rose petals. OH YES…..weirdly wonderful. Truth time. Here’s what I learned after attempting to make this dish. You must truss your birds. Do you know what happened because I didn’t truss them? They came out of the oven with their little tushies up in the air and their legs spread WIDE open. And if that wasn't bad enough, their wings were flailing all over the place. DEAR LORD, grant me the serenity I need to get through this without dying of embarrassment. So the moral of this recipe is, if you don't know how to truss a bird you need to learn how to quickly. 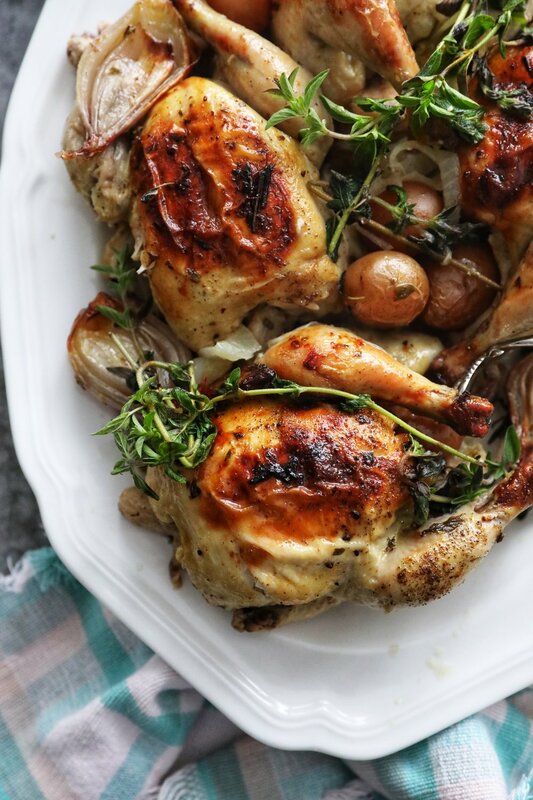 Or, you can just make believe you're a rodeo star and tie these suckers down with cooking twineThe Cornish hens in this recipe come out juicy, moist, with an exotic twist on flavours. You can also reduce the gravy into a delicious thickened sauce to serve as a side or over rice, couscous or veggies.Ya, that sounds like a good plan, doesn't it? Oh, and this recipe can be easily halved or quadrupled. If you can get away with two great, if not the more hens the merrier. The reality of this all is that this is just a ONE PAN MEAL. Yes folks, a one pan meal that is different from all the others. Suffice to say, it looks like a million bucks (as long as these birds cross their legs). Whisk together the lemon or lime juice, olive oil, garlic, oregano leaves, parsley, 1 teaspoon ras el hanout and salt in a bowl. Divide the marinade in between two large zipper bags. Take two hens and place in each bag. Press out air before sealing. Place them in the fridge and let it marinade at least 4 hours or better yet, overnight. When ready to roast the Cornish hens: Pre-heat the oven to 425F. Place the hens and their marinade in a 9 x 13 oven proof dish. Add water or broth and arrange the slices of the onion and shallots around the hens. Sprinkle the hens with freshly ground black pepper, paprika and the remaining teaspoon of ras el hanout. Roast for 20 minutes. Reduce the heat to 375F. Place in small potatoes and roast for another hour or 1 hour 15 minutes basting frequently. Always test the hens to make sure they are fully cooked and the juices run clear. Internal temperature should be 165F. Let them rest for 10 minutes, garnish with fresh additional fresh oregano and serve.